Diamond Fun Casino is an ideal way for your business to celebrate, or can be used as a team building exercise. Are you looking for a way to break the ice with delegates after a conference or business meeting? Diamond Fun Casino could be the answer. 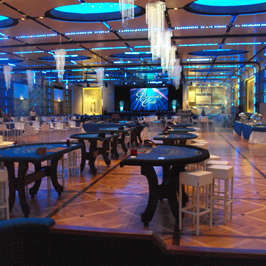 Our fun casino night is perfect for a special business anniversary and a great way to build relations with new clients. Launching a new product? Our fun casino will be very tempting for further potential clients, invite them for an evening with Diamond Fun Casino, while the croupier is shuffling the cards you have a captive audience with your clients. 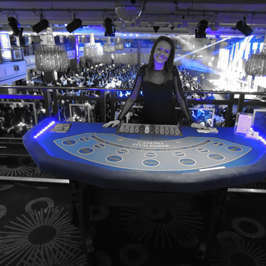 At the start of the event, our friendly and professional croupiers will hand everyone an amount of play for fun money which can be personalised with your logo. Your clients / staff can then exchange these notes for chips at the gaming tables which truly makes for a totally interactive event for all parties. Prizes can be awarded to the fun casino winner, why not offer your clients the chance to test your new product and hand out promotional items as smaller spot prizes? For team building with delegates, we can arrange your delegates into teams to test their skills and team working abilities. We can individualize any event, perhaps if team building is being tested during the day at other sessions extra fun money could be awarded for individual tasks, with the grand finale in the evening with our fun casino to determine who the winning team is. Our fun casino tables are full sized luxury casino tables which are kept in immaculate condition. Our croupiers will wear as standard black evening dress but if you would like us to theme them in your corporate colours or uniform then we will be happy to oblige. Our mobile casino hire may also be used at exhibitions and business fairs, it is an ideal way to attract potential new clients to your stand and make yourselves the talking point of the day! I am writing to thank you and your croupiers at Diamond Fun Casino for helping to make the event we held last week the success it undoubtedly was. This event was a first for my company and I was naturally enough apprehensive about the whole thing. I wanted to leave nothing to chance as my guests represented the top ten customers with whom we deal. 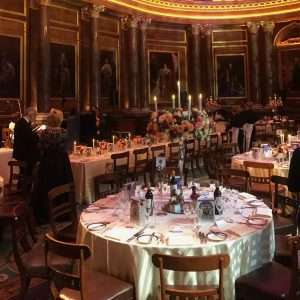 The croupiers were most entertaining, helpful and informative and I thank everyone for the effort so obviously put in, the whole evening was a great success. My company will undoubtedly want to repeat the success of this year and I look forward to planning other such events with you in the future.